Logo Design: Letter, emblem, brand mark, wordmark and combo logos; logo development program. Custom Embroidery: Logos, text, numbers in your choice of colors on garments supplied by us. Minimum quantities starting at 12 pieces. Repeat orders as few as 1 piece. Digitizing: Custom digitizing of logos for use on our embroidery machines. Basic left chest logo starts at $55. 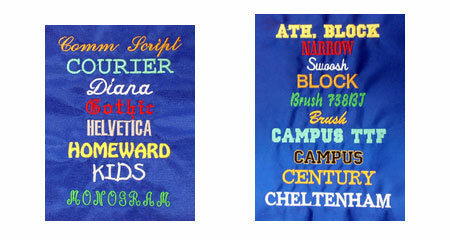 Custom Screen Printing: Logos, text, numbers from 1 color to 4 colour process printing on t-shirts & other garments. Minimum quantities starting at 24 pieces. 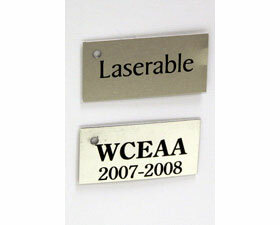 Custom Laser Engraving: Names, dates, award captions, on metal, plastic, glass, acrylic and wood. Our laser can also be used to cut intricate shapes from various materials for personal or industrial applications. 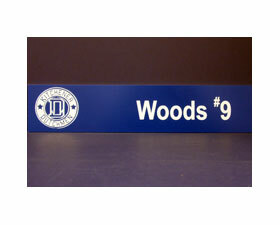 Custom Dye Sublimation: Names, dates, captions, & full colour graphics on specialized metal, plastic, acrylic, slate finish items that we supply. See below for more information on our services. A Logo can provide a clear visual impression of your company, its mission, capabilities, and core values. It's also a way to stir emotions in your customers and motivate them to engage with your business. Through consistent use of the same logo and colours it will become instrumental in building brand awareness for your organization and communicate a consistent message to current and potential customers. The type of logo you ultimately choose will have a huge impact on how your brand is formed and recognized. With our wealth of experience in Printing, Embroidery and Engraving, we design your logo with the end products in mind so that your logo can easily be imprinted on the largest variety of items to suit your marketing requirements both now and in the future. Letter: Letter mark logos become a recognizable symbol for the company name by making a strong impression in a compact logo. Emblem: Text inside a Geometric shape creates an iconic logo that can convey professionalism, competence, and strength. Brand Mark: Brand mark logos use a single graphic or symbol and doesn't incorporate the company's name and is able to transcend language barriers. Wordmark: It's best to choose this style when a company has a memorable, single-word name. By selecting the right typeface you can create a logo that conveys a sense of sophistication and professionalism. Combo: Logos can include both the company name and a graphic component to help build and reinforce the brand and add visual punch with the help of a symbol. With so much riding on their logo, companies must choose their logos wisely. We offer face-to-face consultations and request that you also invest your time in some homework to ensure that the end result reflects positively on your company for years to come. Left chest embroidery file of your new logo up to 10,000 stitches. *Additional revisions and consultations are extra and are billed at $50 per hour. Business card design packages are also available. Mega Health at Work Inc. This "combo" logo was developed for Mega Health at Work Inc., a company whom transforms lives through workforce development that integrates leadership, education, and practice. They are a unique business with the goal to changing cultural barriers mainly within high stress occupations such as Fire, Police, and Paramedics. The icon element incorporates a representation of helping those in need while at the same time is an initialism. Along with our clients, the font style, text location, spacing and colours were selected to represent urgency and health. The Waterloo Craftsmen logo design was a revisioning of the client's current logo with a desire to convey their foundation of experience with designing, building and renovations of homes as well as a vision towards the future. The font style was selected to convey the company's heritage while not being overly trendy. The colours were continued on from their current logo to assist in the transition to the new brand. 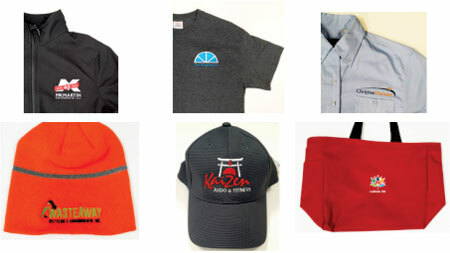 We offer in house Custom Embroidery and logo set ups to display your Company or Organization logo on any of our brand name garments including T-Shirts, Golf Shirts and Polo Shirts, Sweats, Hoodies, Jackets, Fleece, Leather, formal Dress Shirts, casual Dress Shirts and High-Visibility Clothing and Safety Wear, along with Hats and Toques. We do our own embroidery, handling quantities from 1 to 1000 or more with a capacity of up to 500 pieces per week. Put your logo on your employees' clothing for added exposure and professionalism. Note that, for us to control product quality, offer warranties and on time delivery, we do not offer contract embroidery services. We only decorate garments that we supply. Please allow 1-2 weeks for completion of orders. Our busiest time of year is November - December, please plan early and allow up to 3 weeks for completion at that time of year. It should not cost you an arm and a leg to get started with custom embroidery! We are here to help you get started and get the most out of your marketing dollars. We now offer a flat rate charge of $55 to set up your logo. 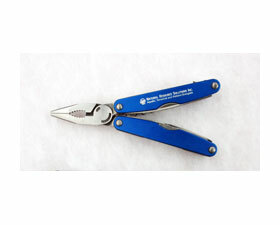 This fee is good for logos up to 4.5 inches wide and up to 10000 stitches. This includes a sample "stitch-out" on twill for your approval. Many people confuse digitizing with a digital graphic image like a JPEG or TIFF. Digitizing in the embroidery world is the process of taking artwork in a digital form like a JPEG, TIFF, PDF or EPS file and converting that information into a language that drives the computerized embroidery machine that creates beautiful and detailed artwork using thread on a variety of garments. Below are some sample "stitch-outs". NEW $55 FLAT RATE PRICING FOR DIGITIZING LOGOS FOR EMBROIDERY!!! Pricing for digitizing a logo, text or image is based on the number of stitches required to complete the design. A typical logo that is usually placed on the left chest of a shirt is about 1 inch high by 4 inches wide and uses about 6000-10,000 stitches. By comparison, a logo that covers the full back of a jacket measuring about 7 inches by 10 inches use about 110,000 stitches. Pricing is usually based on a price per thousand stitches. Digitizing is a onetime expense and usually ranges from $55 and up. 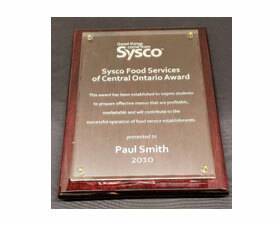 Once we have your digitized logo on file, we can easily and quickly produce subsequent orders. We will always provide you with an estimate before proceeding with the digitizing process. You will always get to see a stitch sample before we embroider a logo for the first time. The preferred file type for artwork that you submit to us is EPS or PDF. (JPEG or PNG will work but may have some limitations if we have to scale the image). We can screen print logos, text, and numbers on T-shirts, fleece and some jackets and polos using 1 to 7 spot colours, or complete 4 colour process printing. NOTE: Screen Printing requires a fair amount of set up - 1 screen for each color and each printing location. Set up costs for each color and each imprint is $25, plus the cost of printing. The more shirts you print, the cheaper the cost per shirt. Note that, for us to control product quality, offer warranties and on time delivery, we do not offer contract screen printing services. We only decorate garments that we supply. Our minimum order requirement for screen printing is 24 pieces same imprint. (Mix of Tees and Fleece is possible). Set up: $25 per colour/per location (does not apply to Numbers or Individual names - see below). Four colour (CYMK) process printing set up is $350 - Minimum 100 pieces required for 4CP printing. Please Allow 2 weeks to complete orders. Are you supplying any artwork? Artwork should be in Vector EPS, or Vector PDF format with fonts converted to curves. These files are usually created using Adobe Illustrator or CorelDraw. JPEG and TIFF files are not suitable formats. If you only have JPG,TIF, SVG, or PNG files they will be converted to vector files for printing for an additional fee of $15-25 per file. We will provide this in our quote. 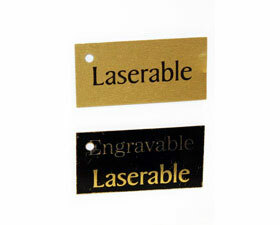 Using our state-of-the-art Laser Engraving machine we can engrave logos, names, dates, and award captions, on metal, plastic, glass, acrylic and wood. Custom lasered design and custom laser cut sizes. 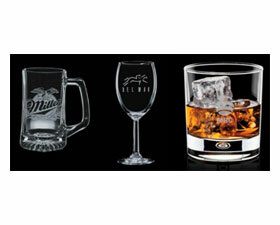 We stock 15 oz Beer Mugs STF351, 8 0z Wine Glasses SWG362 and 12 oz On-The Rocks BWG2521. We also offer a huge selection of special order drinkware. 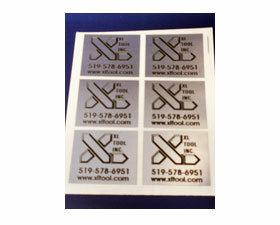 We only laser etch on glass items that we supply and sell. This is so that we can control quality, offer warranties and have items that are known to engrave well and fit on to our equipment. Sample of laser engraved black brass with gold underlay. 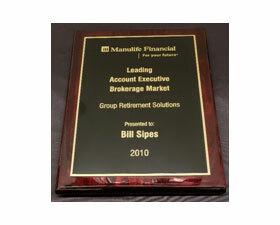 Sample of laser engraved glass, mounted on rosewood plaque. Maple wood finish also available. 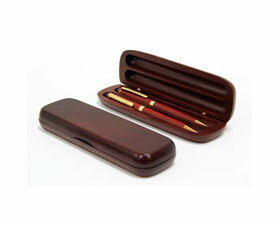 Replaces old style scratch engraving. 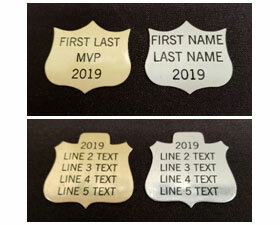 This means all text will be black on gold or silver - not deep scratch engraved.